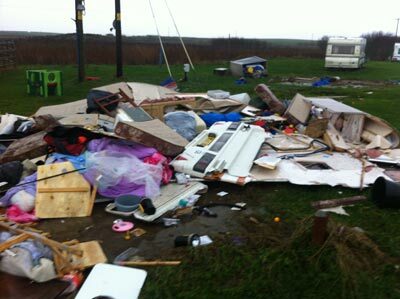 A freak 80mph ‘Tornado’ which struck the Welsh coast has caused severe damage on a caravan site in Anglesey, flipping over a number of caravans including an aptly named ‘Elddis Typhoon’ insured by Caravan Guard. 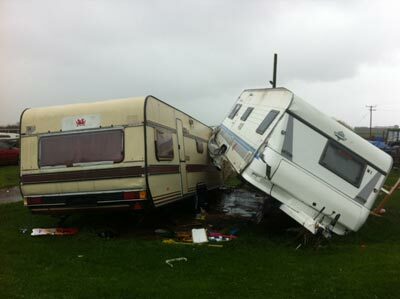 Luckily nobody was hurt during the disastrous storm but as you can see from the photos taken by one of Development Managers at the site the extreme weather has caused massive damage, with many caravans hurtling into each other and one even being flung 50 feet in the air at Sandy Beach Caravan Park. Towing a touring caravan is also a very risky prospect in high winds, and as such Caravan Guard recently released information explaining how to remain safe should you be forced to tow your caravan in strong winds. 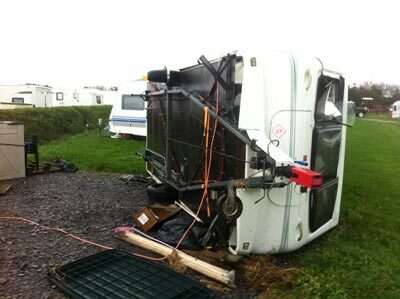 To read this useful info read our article “Towing a touring caravan in high winds”.